Despite being sanitised for the benefit of the World Cup and upcoming Olympic Games, OMA’s Reinier de Graaf sees the much-discussed favelas of Rio de Janeiro as a stark, if vital, reflection of the paradox of exponential growth — in which those who have traded countryside for city are denied a proper urban life. This summer I visited Rio de Janeiro, in the interregnum between the World Cup and the 2016 Olympics. Until then I had only known it through its carefully cultivated image: samba, futebol, Copacabana and Oscar Niemeyer. All of them are there, and in that sense the image is not built on lies. Like the beauty industry, Rio's glamour stems from a combination of selective exposure and heavy editing. Niemeyer was a communist. One is reminded of that only when you actually go to Brazil. The supple, seemingly effortless curves of his architecture acquire their real significance when viewed in the context of Brazil's daily struggles. An architecture ostensibly dedicated to the elimination of any visible sign of creative struggle serves as a promise that eventually all struggles will be a thing of the past. Niemeyer's curves, applied indiscriminately, irrespective of scale -- from lush, hedonistic villas to mass housing projects -- have a kind of 'classless' appeal to architecture connoisseurs and casual observers alike. The reason for my visit to Brazil, and to Rio in particular, is the 2014 Global Infrastructure Initiative (GII), a conference and chaired by former American Secretary of State Madeline Albright. The attendees are a curious mix of transport and technology executives, engineers, financiers, and (former) politicians. Even the American military is present. The focus of the conference is 'Infrastructure and the City', the highlight of which, on Day 2, is an appearance by Eduardo Paes, mayor of Rio de Janeiro, who delivers a half-nervous, half-comical account of the troubled life of a mayor who had the 'wisdom' of wishing upon his city both the World Cup and the Olympics in a space of less than two years. His speech is a weird combination of mea culpa and self-pity; Brazil's major cultural accomplishment, so he claims, is that it doesn't hide poverty. I decide to leave. I want to see for myself. I head to the north of Rio, to the favelas, which, since the announcement of the World Cup, have become an integral part of Brazil's external image. Incorporated into the feel-good maelstrom of modern media, the favela now sits comfortably within Rio's official DNA. David Beckham, football's golden boy, has bought a property in the (now gentrified) Favela do Vidigal. Still, it is only the politically correct form that permits viewing: the favelas directly adjacent to the city centre that have made it into the director's cut, equipped with satellite dishes and manicured terraces. 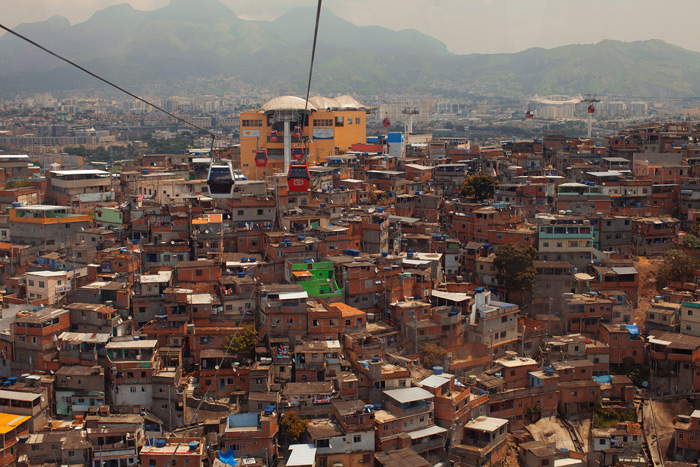 In the context of a ubiquitous imperative for cities to generate 'value', even favelas have turned into a form of real estate, following the inevitable path to gentrification: legalised overnight, supplied with electricity and district heating, they look like a kind of impromptu Moshe Safdie scheme. 'Brazil doesn't hide poverty', but it keeps a safe distance between its viewers and victims. Seen from the comfort of the Copacabana Hotel, the favela doesn't radiate a level of poverty which is overly worrying to the establishment (or the accidental tourist). Close to the city centre, the favela is just another part of the varied cityscape of what the Lonely Planet guide calls 'a city in which life is anything but subdued'. Not here, though. This is Zona Norte, home to the Maracanã stadium, the university and most of Rio's samba schools. 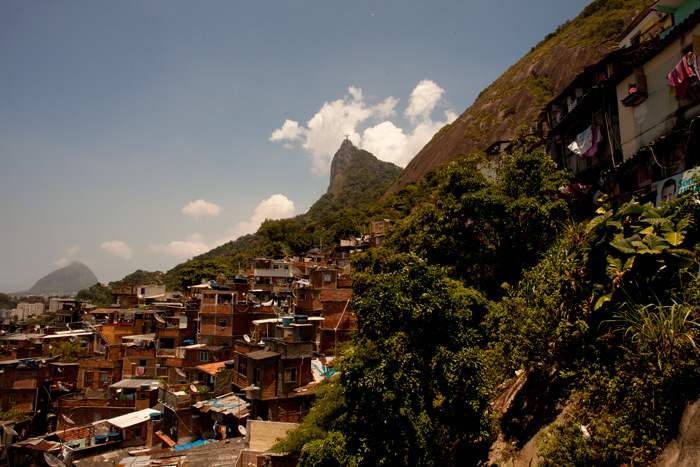 It is also one of the poorest and most spread out favela areas of Rio de Janeiro. Endless shacks cover the hills like a kind of pixelated fungus. The mayor, I'm told, doesn't come here; the organisation of the World Cup, and the 'pacification' process that ensued in its wake, have not made him very popular. Here the city looks at war with itself. A large police force, the UPP (Pacifying Police Unit), with bulletproof vests and M16 automatic rifles are the answer to the local armament of choice: AK-47s -- supposedly larger in number in this area than refrigerators. South America's history is multifariously contested, and 'La Revolución' is still invoked in many parts of South America as the legitimisation for its prolific violence, but shortly after the World Cup and the Olympics much of that feels like belated folklore. 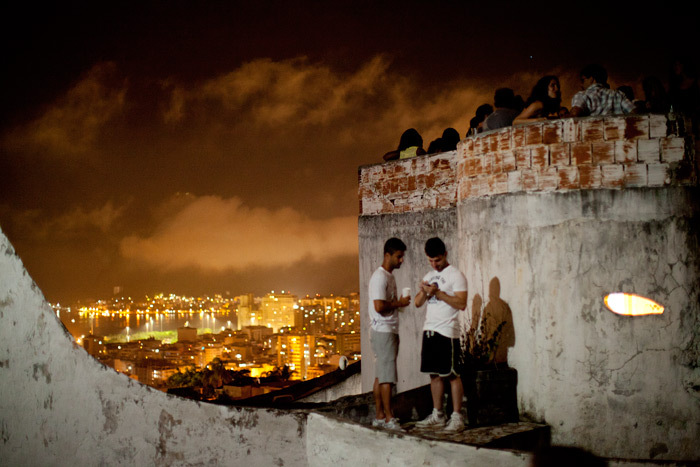 Favela dwellers gather on a roof above Rio's more conventional city districts. The official definition of a favela is constituted by the absence of 'asphalt', that is the absence of roads constructed by the municipal authorities. In the favela, the roads are made by the inhabitants themselves, improvised as needed, and not part of the city's official street plan. Giving directions to my taxi driver, he constructs that my destination must be in the favelas and initially refuses to take me there. Only after passing him the phone to speak with the person I am supposed to meet, does he reluctantly comply. 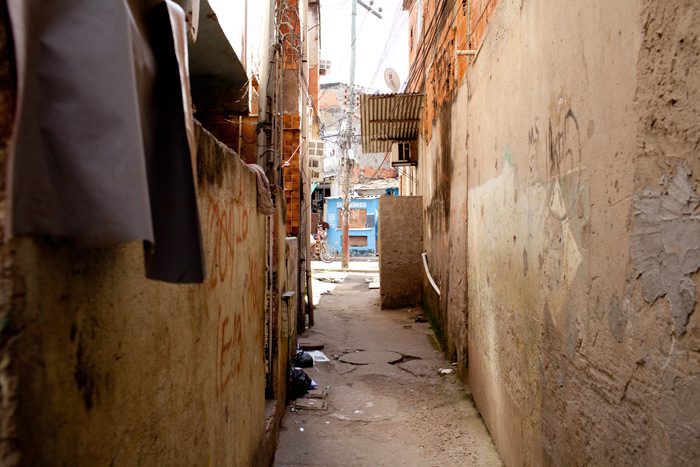 In the absence of street names, people in the favelas do not have a registered address. This has major implications. Favela residents cannot register for many schools or universities, or access healthcare. Obtaining a bank account is not on the cards; without bank accounts, money transfers to pay regular bills for electricity, running water and internet are inherently problematic, so these are mostly illegally tapped. People do not own their homes and the state can, at any time, invoke its right to access its land and destroy anything built on it. This highly tentative, precarious condition makes favela life and the economy within it part of a permanent shadow zone. As long as the settlements remain illegal, so too does any type of life that takes place here. Even more harmless economic activities, such as the trading of second-hand goods, is by definition a black market. Inside the favelas, the rule of drug gangs is rivalled by that of informal militia, formed of off-duty (and sometimes even on-duty) policemen, firemen, prison guards, members of the military and many local residents. Subsequently, the favelas find themselves caught between two types of crime: the crimes committed by the drug gangs, and the crimes committed by those fighting the drug gangs. Roughly one fifth of Rio's inhabitants are estimated to be favela residents, many of whom live in a state of exception. The favelas constitute a kind of universe on their own: a state within the state, with an economy unaccounted for by official statistics. The first favelas were established in the late-19th century by veteran soldiers with no place to live. Most of the current favelas really expanded in the Seventies, as a construction boom in the more affluent districts of Rio de Janeiro initiated a rural exodus of workers from poorer states in Brazil. It was not until the Eighties, after the collapse of Brazil's economy, that the favelas found themselves associated with drugs. Changing routes of production and consumption make Rio a prime transit point for cocaine destined for Europe. 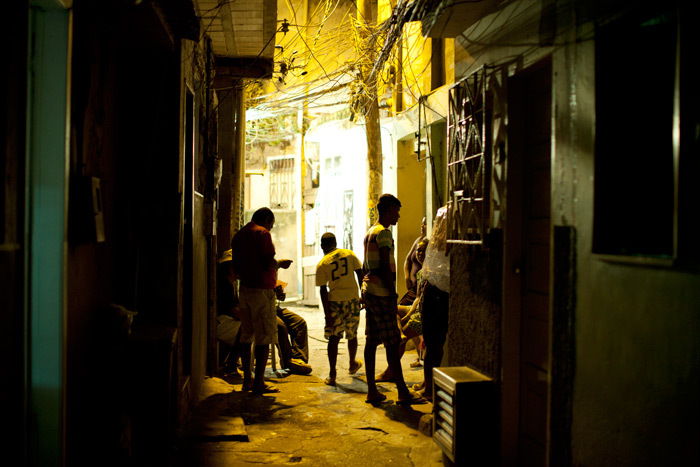 Prospects of higher incomes earned from drugs propel these to become a predominant part of the favelas' economy. While the favela areas 'under pacification' have seen improvements, there has been an increase in the activity of drug gangs in other parts of Rio de Janeiro that lack permanent UPP forces -- which have themselves been subject to scandal and corruption. Among these areas are the neighbourhoods in the Zona Norte, the frontier of the pacifying process. As such it forms a strange hybrid between the supposed reinstatement of state control and the former free-state prior to pacification. Brazil's urban population has grown dramatically over the past decades. 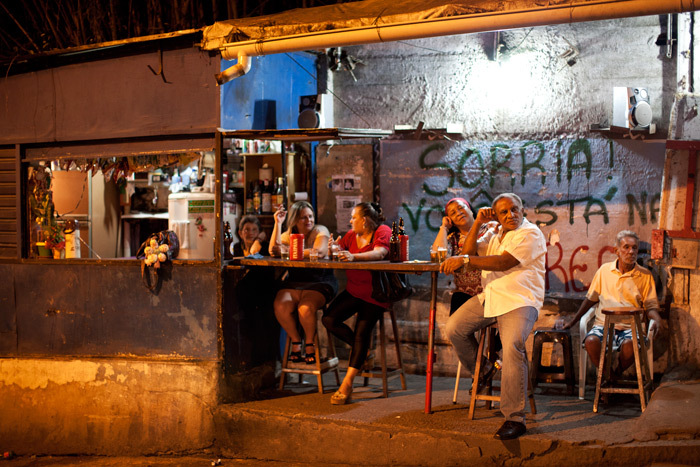 In 1950, only 30 per cent of all Brazilians lived in cities; today it is 85 per cent. In the same period, Rio de Janeiro's metropolitan population grew from three to 12 million people. The growth of Rio has happened faster than its economy or its infrastructure has been able to sustain, and the situation is emblematic for most major cities in Brazil. The spectacular growth of these cities, as we have seen over the past few decades, does not necessarily mean that more people have become urbanite. The influx of new and ever-poorer inhabitants is bigger than most cities can handle. There is a strange paradox at play: while those who flock to the city are often denied access to a proper urban life, the existing elite retreats into gated communities reminiscent of the lifestyle of feudal landowners. In that sense, the growth of cities seems to give rise to hyper versions of the rural. Many cities worlwide resort to an evermore elaborate repertoire of denial in the face of mounting problems. Inhabitants that 'overload the system' are increasingly denied access to a city's administrative body, forcing them into a situation where they officially do not exist: Rio's favela residents do not have an address; Moscow's immigrant workers are not counted as part of Moscow's population; and through the Hukou system in China being a city dweller is a 'birthright', denying many of China's rural migrants any hope of gaining the right to live legally in the city. The contemporary city breeds a kind of schizophrenic reality. On the one hand there is the official version, expressed in censuses and municipal data; on the other hand there is the unofficial, or rather real city, with a large number of non-registered (illegal) residents, creating a vast yet administratively invisible urban population. It is precisely this false promise that constitutes the most venomous aspect of our current fixation on the city. The more the world aspires to a shiny, urbane life, the more it finds this kind of life unattainable. For the illegal migrant worker in Moscow, an idealised, tech-driven urban environment is no more of a reality than it is for the inhabitants of Rio's favelas. In the wake of a massive urban influx, we are witnessing the emergence of another kind of 'citizen of the world': those who have drawn the short straw of globalisation and for whom being cosmopolitan simply amounts to being a new 'cosmoproletariat'. On the last day of the conference, organised by the international management consultancy firm McKinsey & Co, we go on an excursion to the Centro de Operaçoes of Rio de Janeiro, a kind of ersatz digital town hall from which life in the city is 'managed'. The place invokes a curious mix of optimism and discomfort. The possibilities of (digital) technology are clearly impressive, but the metaphor underlying the design of the centre's interior -- like NASA's control room in Houston -- conveys a rather disturbing flip-side, where the city is encountered like an inevitable fact of nature: outer space observed from a screen. No longer is the city -- made by us, for us -- our own creation over which we exercise free will. The city happens to us; an extraneous phenomenon, the behaviour of which we at best can hope to predict... When it comes to the governance of our cities, technology has largely obscured, rather than clarified, our view. It is as though the supposed omniscience of the digital has allowed the political sphere to perform a Houdini-like trick; simulations of reality permit an infinite deferral of political choices. We can now see the favela residents on a computer screen, study their informal patterns and predict when they might make trouble, but in no way does their visibility constitute a step towards any real civic recognition and all that comes with that. In systemically escaping the question of political responsibility, simply analysing the consequences of our own actions alongside (and on a par with) natural disasters, we set the city on a course to become one. If globalisation has exported metropolitan conditions into the third world, it has also imported third-world conditions into the metropolis. In becoming urban we have not overcome the fundamental inequalities that govern our economic system. The latter half of the 20th century was characterised by a precarious stand-off between two competing political ideologies. In a battle between dollars and demographics, leading economies of the West were challenged by an ideology seeking (and finding) the support of those left behind: in Korea, Southeast Asia, and later, in Latin America and Africa. The next ideological battle will be fought not over continents, but over cities. The challenge will come from whoever can galvanise the support of those denied a voice in the (fracturing) urban condition. It will no longer be about who should govern, it will be about the question of governance itself, the end of which comes when it can no longer deliver on its promises.